The Logitech Alert motion-detecting security systems are pretty high quality cameras—15FPS/720p wide-angle lens—and convenient—they're powered and networked over your home's electrical system. I don't want to be a security guard, but monitoring my own house is now fun. $300 for the 750i indoor version, $350 for the 750e weather-proof outdoor version with night-vision. An additional $80 a year if you want the Alert Web and Mobile commander—managing the camera via a web browser or your iPhone, Android and BlackBerry, inside or outside your home network. You can view the cameras for free, on web and mobile, but you can't get all the features of the desktop software suite on the web or on the phone unless you pay. Convenient, useful and quite good quality when you compare them to video systems normally included with home alarm systems. I tested the 750i internal system, and setup was quite easy—only one or two degrees harder than setting up a webcam. There are various ways to mount the device—on a stand, with a suction cup, or screwed into a wall with a rack-type mount. It's completely wired. Unlike the Vue, which is battery-powered and wireless, or other security cameras, which are AC-powered and wireless, the Logitech Alert avoids both battery-replacement hassles and wireless interference. It even has audio! All you have to do is plug the powerline-enabled camera into a wall socket (power strip does not work), and a second powerline network receiver into another socket, next to a router or switch. The receiver then goes Cat5 into your home network, and out to the internet. To view live or recorded streams, you can either use the Windows-only Logitech Alert Commander, or subscribe to the Alert Web to get the web-based, anywhere-accessible version and the cellphone viewer. If you don't need to do cellphone viewing, you can approximate the web-version by keeping a PC on at all times at home, and then VNCing into it when you're outside your house. Video quality will be a bit worse, but most of the time you don't need the video to be that smooth anyhow. There's an included microSD card inside the camera to save triggered events, and you can also have your Logitech Alert software automatically download those events to your PC as well. The 750i has a 960x720 @ 15FPS camera with 130-degree wide-angle lens that covers a pretty big area at a decent frame rate. You can zoom in if you want, but I prefer the zoomed out full view. Here's a sample video of me coming back from a lunch run. 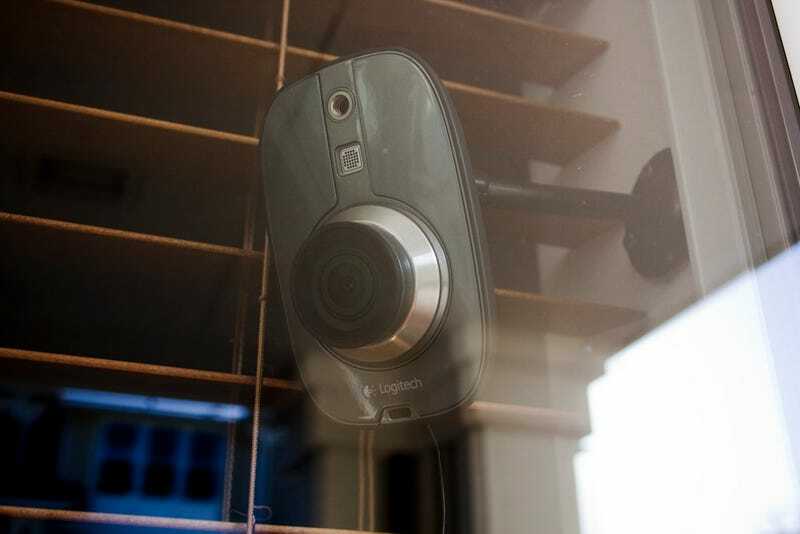 It's pretty darn good—Logitech knows how to make webcams—especially compared to, again, more traditional home security cameras. This video's slightly compressed when uploaded to our system, but you can get a good sense of how it looks.